Now an international bestseller. In stores December 12. 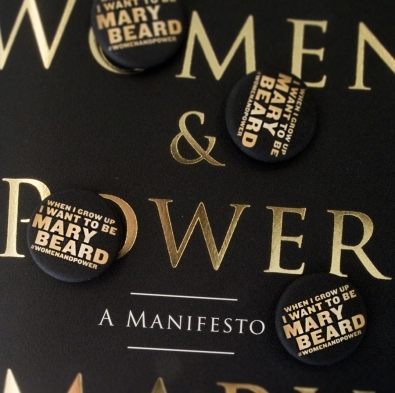 Order WOMEN & POWER and get a Mary Beard button! At long last, Mary Beard addresses in one brave book the misogynists and trolls who mercilessly attack and demean women the world over, including, very often, Mary herself. In Women & Power, she traces the origins of this misogyny to its ancient roots, examining the pitfalls of gender and the ways that history has mistreated strong women since time immemorial. As far back as Homer’s Odyssey, Beard shows, women have been prohibited from leadership roles in civic life, public speech being defined as inherently male. From Medusa to Philomela (whose tongue was cut out), from Hillary Clinton to Elizabeth Warren (who was told to sit down), Beard draws illuminating parallels between our cultural assumptions about women’s relationship to power—and how powerful women provide a necessary example for all women who must resist being vacuumed into a male template. With personal reflections on her own online experiences with sexism, Beard asks: If women aren’t perceived to be within the structure of power, isn’t it power itself we need to redefine? And how many more centuries should we be expected to wait? Check out reader reviews on Goodreads.